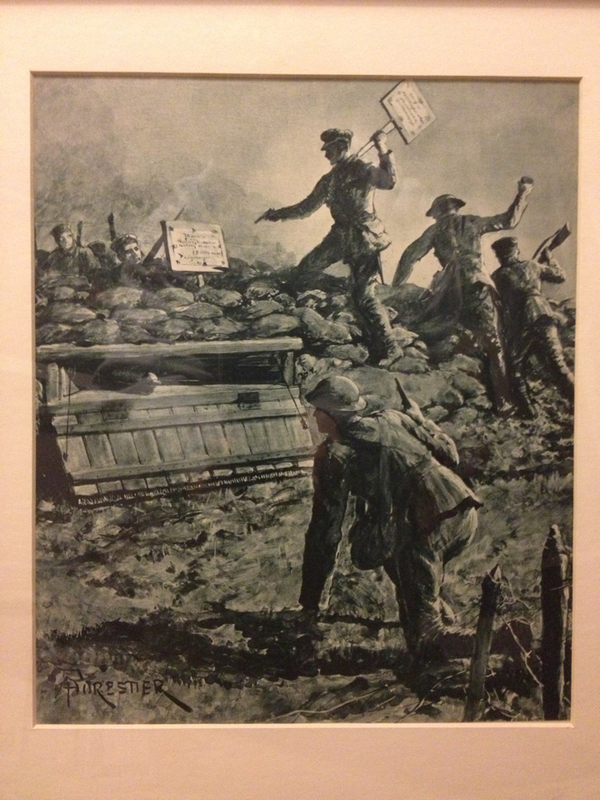 Rare photo of WW1 Trench Sign, breaking news of Easter Rising | Come Here To Me! 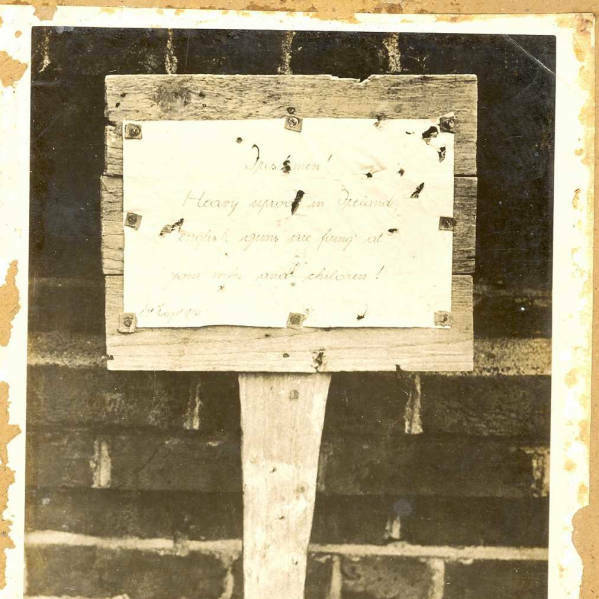 Fascinating photo showing a handmade sign made by German soldiers in the trenches during World War 1, telling the Irish regiment of the British Army in the trench ahead of them that Dublin was being bombarded in response to the Easter Rising. 1916 Trench Sign – Irish Regiment. Copyright – The Great War Archive, University of Oxford / Primary Contributor. … it given to my granddad by a Major Hand in the 1930’s. My granddad was working for the Major (a retried British Army Officer) as a gardener in Mooncoin, Co. Kilkenny … the Major told my Granddad that they fired a few rounds at the sign and did not believe or understand what the sign was about till weeks later when the news filtered through about the 1916 rising … The Major took the photo, after the British had captured the German trench a month later. Massive thanks to Damian Shiels (Rubicon Heritage) who sent us on this picture. Raid to capture sign. Credit – Imperial War Museum. That is a fascinating object and it’s discovery is significant- when we were organising the ‘Soldiers & Chiefs’ exhibition in the National Museum we sought out a similar sign that we had record of, held in the collections of the Imperial War Museum.The IWM eventually put it on display the Imperial War Museum of the North in Manchester.The fact that there are at least two suggests there was a concerted effort across a number of German units to inform Irish troops of the Rising, and also suggests it was a German command decision to put up the signs rather than the decision of a few isolated German soldiers. It also goes to show that men in the trenches tended to know exactly where their opposite numbers were from. The example in the IWM has an interesting story in itself, it was placed across from a battalion of the Royal Dublin Fusiliers (if I remember correctly) who opened fire on the sign, and actually launched a trench raid to capture it. They afterwards officially presented it to the King to show their loyalty, and it was from there it eventually ended up in the IWM. It got quite a bit of coverage at the time, and a number of periodicals ran sketches of the Dubs taking the sign during the raid (I have one such on the wall of my office!). Thanks so much for the informative comment Damian. I realised reading it again it is in all probability the same sign as is in the Imperial War Museum, which discounts much of what I said! Nonetheless a fascinating object! The IWM have some amazing material relating to Ireland in their collections, including the official 1916 Rising surrender-much of it is little known, so it is well worth checking out what they have. I will try to send on an image of the raid launched to take the sign for you. From Larry Nugent’s BMH witness statement, the British Army dressed an officer up in Irish Volunteer uniform to tour ‘Irish’ regiments after the Rising, so clearly they were concerned. From other BMH witness statements we also have information that the Dublin Fusiliers at least were withdrawn from contact with the rebels (Tom Byrne and others recount RDF deserters fighting with them), and that after the Rising these regiments were quickly sent abroad, to be replaced by British units recruited from outside Ireland. This is very interesting. My grandmother used to tell me that she had been told by her brothers and cousins that the German’s would shout across to the Irish in the trenches and tell them the British were killing their families at home. I never believed that until I saw this, so thanks.